Gorham disease is a rare condition affecting bones of skeletal system with unknown cause. To our knowledge the number of identified cases worldwide ranges around 300. Gorham and Stout were the first to define this disease back in 1954 and 1955. Since then different terms have been used to describe the disorder, such as Gorham disease, vanishing bone disease, or phantom bone disease. Due to the rare nature the knowledge available to us is limited, and often relies on cases reported in the scientific literature. Fig. 1. 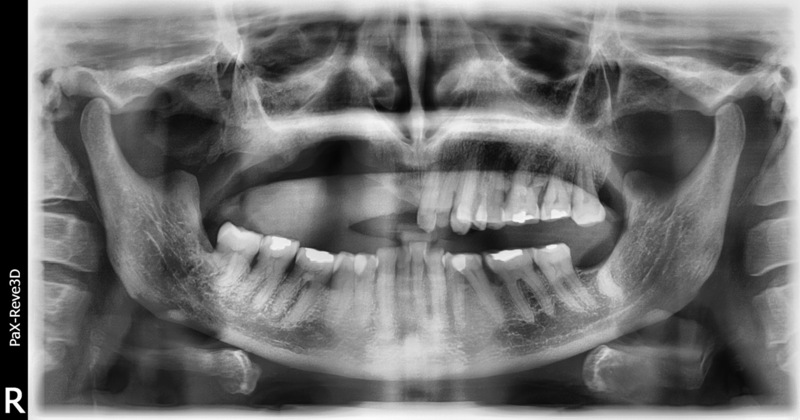 Panoramic radiograph depicts the extensive bone loss limited to the right side of the upper jaw. Teeth on the affected side are missing as a result of bone degradation. The causing factors proposed for the occurrence of the disease is that an initial trauma and/or a slow blood flow to the affected area with resulting lower oxygen levels It is thought that a low levels of oxygen will create a lower pH contributing to an increased activity level of hydrolytic enzymes and therefore to the process of bone resorption. 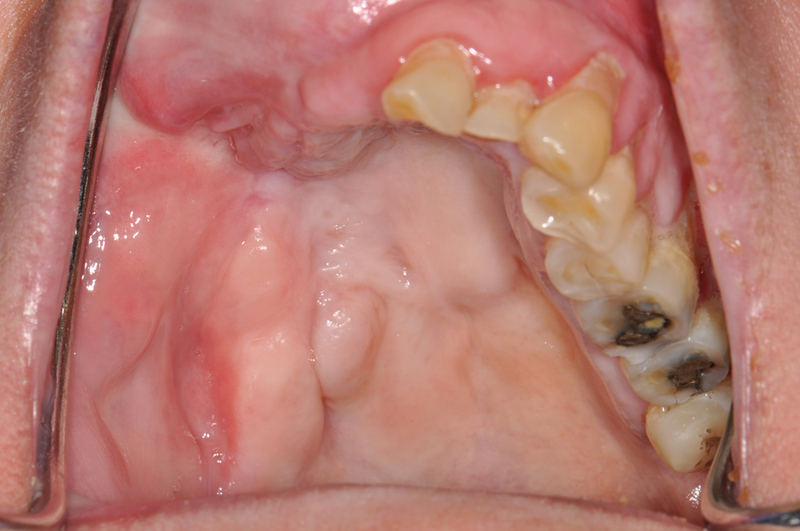 The course of the disease is unpredictable and initial bone resorption may spontaneously halt. The condition is typically characterized by a massive dissolution of affected bony structures. The loss of bone is severe, aggressive, and fast progressing. In most cases the bones of lower trunk and shoulders are involved, and in rare instances the jaw bones (Fig. 1). When affecting the jaws, the condition manifest with periodic facial swelling, mild to moderate pain, and loosening or loss of teeth (Fig. 2). In more extreme cases the facial skeleton can become weakened and lead to spontaneous fractures with possible deformities of the face. Identifying Gorham disease in patients is challenging and can be quite difficult and usually done by exclusion of similar malignant or metabolic disorders. A variety of treatments can be used to stop the dissolution of bone, however, a definitive or standard treatment regimen has not been yet developed. Treatment have been suggested, including low dose radiation therapy, bisphosphonates, excision, bone grafting, calcium supplements, and vitamin D supplements, but with variable success. A spontaneous arrest of the disease without treatment been reported. Rare incidence of Gorham disease with limited involvement of the maxilla: case report.